Residents of Majiyagbe area of Ipaja in Lagos State of Nigeria has been in darkness for about seven days as last weekend. There is no hope that power supply will soon be restored in the area. Despite what has become epileptic power supply in Nigeria, which foundation dates back to a time immediately after the country's independence in 1960, people say when they are hit with endless days of power failure, they feel like living in perpetual darkness. Last week, a young woman had planned her marriage introduction with fervent prayers that there will be power supply that will suggest the presence of light. She wanted to avoid what lack of light would suggest -lack of blessings - to her nocturnal ceremony. She said that for five days, she prayed that there would be light and that she believed that God answered her prayers, because on the day for the marriage introduction, power returned. However, the joy from having seen power restored was short lived, as the power went off as soon as it was restored. According to one of her neighbors, the power that was restored and taken away as soon as it was restored after five days of darkness was caused by a damage in the transformer that services the area. It is what people here say are results of frustration for living in darkness. Artisans who need power to work but lack it cry in silence. "I have packed up the industrial machines and resorted to the use of manual machines. The result is the pain I begin having on my legs," a female tailoring proprietress on Oloruntedo Street said. "I cannot express in words what we suffer due to lack of regular power supply. The current failure has been on for five days. They brought it on Saturday and immediately took it again. And we learnt that there is a problem with the transformer." "No power, no work," Idowu Ilesanmi, a leading welder in the area said. "Things are getting better now with a new government and the resolve by people seeking a change. The number of days we have light have increased compared to the past, because transformer hawkers can no longer hide transformers. Despite our experience and frustration here, I can bet that there are other areas with worse experience," he submitted. Ilesanmi said that the transformer that had been perceived as the one damaged and responsible for the power failure in Majjiyae wasn't the one but another one - pointed reporters to an area about three blocks away - from his residence. He said the transformer perceived as damaged and the cause of the power failure serves a different section of the same community. However, it was discovered following investigations that the other part of the community with the undamaged transformer also had not have power for days. Another community near Majiyagbe called Olubodu also did not have power. Frank Kelechi who spoke to Global Pentorch following an investigation said the area he lives has been having power close to 16 hours in 24 hours compared to other communities around it. But he said he learnt that a major fault in a feeder transformer caused their being in darkness last Tuesday when he was interviewed. Asked whether having 16 hours of power supply was normal, Kelechi said it was about living with what you have. Kelechi agrees that a larger part of the 16 hours supply may have been coming in the night, and that as such, it would be no use to artisans, and customers - who have to bear the burden of paying more than the usual price for overhead that arises form the use of generators. 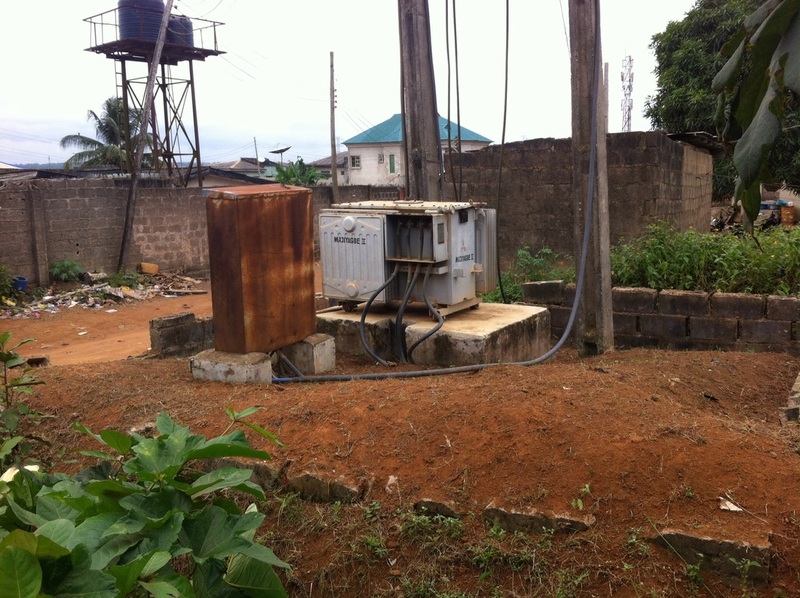 Using generators in Nigeria is no longer the preserve of the rich and the affluent. But the size of a generator one uses will depend on one's status. Everywhere one goes, the crying sound of generators have become a familiar note. There are people, such as generator dealers and repairers who are benefiting from the malaise. It may not be their fault that work is available for them to do and pray for it to continue that way, but that of successive governments in the country from independence, for lack of consideration to generate stable electric power supply and that makes it seems like a lifetime of living in perpetual darkness.